CVM Style Vacuum Components are usually directly Interchangeable with or replace versions of components such as PFG, PBG, PJG, PCG, PUGB Vacuum Pads made by others. All suction cups are dimensionally identical for exact replacement. You can not tell the difference unless you study them closely and even then you will not be sure. The main difference is that our prices are lower. The rubber compound, fit and finish are excellent. We offer top quality, excellent prices and prompt delivery. We currently offer most key components of which you can find some here and others throughout our website per item type. The ANVER CVM Series of components were developed though customer requests requiring replacement of worn items on imported machinery. 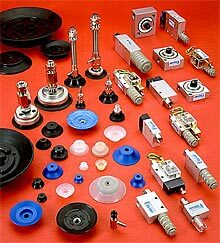 We have thus the main items such as the rubber suction cups, fittings, pumps, filters etc as these are the only parts of the line, which we see demand for. If you need something else let us know. We are always looking for new products to develop, and can probably save you time and money on these too.